LANSING — West Michigan’s DeVos family made more political contributions than any other family or individual in the state for the 2016 election, according to campaign finance records. And it wasn’t even close. Having made about $15 million in political contributions, the DeVos family leads the list of the 40 top family or individual givers in Michigan in the last election cycle, according to the Michigan Campaign Finance Network's (MCFN) tracking. Across the entire list, the top Michigan-tied givers made about $44 million in contributions at the state and federal levels in 2015 and 2016. That total is significant. The 110 races for seats in in the Michigan state House cost about $27 million in 2016. About $2 million of that — or 7 percent — came directly to state House candidates and their committees from donors on the top 40 list. Even more money flowed to the races through political parties and political action committees (PACs) the donors supported, sending the actual percentage much higher. The donors’ contributions went to all types of political fundraising efforts, including ballot committees, special interest groups' PACs, state parties, presidential candidates and Super PACs, which can raise and spend unlimited amounts. The majority of the top donors’ contributions, about $34.0 million, went to candidates or committees focused on federal races. About $10.7 million went to state candidates or committees focused on state races. MCFN examined the political contributions in Michigan and at the federal level of about 80 individuals or families who tend to give heavily to see which donors landed among the 40 most active donors in the state last cycle, according to this tally. Those donors came from a variety of industries. Some were powerful lawyers, like the Bernstein family. 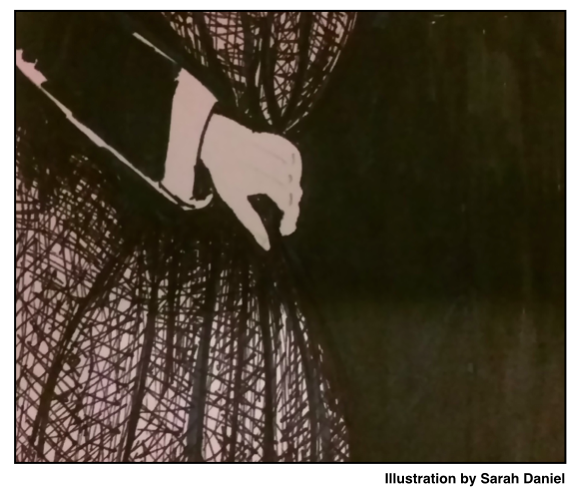 Others ran retail businesses, like Meijer, while still others worked in the health care field, like the Cotton family. Despite their different backgrounds, the top donors tended to favor Republican candidates and causes with 29 of the 40 donors giving a majority of their contributions to Republicans or GOP-leaning groups. Just five of the top donors gave a majority of their contributions to Democrats or Democratic-leaning groups. For the other six donors, they didn’t give a majority of their contributions to clearly partisan committees. There was also a clear divide in how much the top donors gave to Michigan’s two major political parties. The 40 top donors gave about $3.3 million to the Michigan Republican Party’s main state and federal committees while giving just $2,610 to the Michigan Democratic Party’s main committees, according to campaign finance disclosures. The full top-donor list compiled by MCFN is available here. It includes information on groups that received large amounts of money from the donors. MCFN's list of top donors for state-level races for the 2013-2014 election cycle is available here (note: the new list includes state and federal giving). Members of West Michigan’s DeVos family combined to make $15.0 million in contributions during the 2015-2016 cycle. The majority of the total, $11.6, million went to federal candidates and committees while $3.4 million went to state candidates and committees, according to MCFN's tally. The family, whose patriarch helped found the home and beauty product company Amway, gave $1.5 million to Republican National Committee and $1.3 million to the Michigan Republican Party, according to the campaign finance reports. The House Republican Campaign Committee, which was in a fight for control of the Michigan House, received $720,000 from DeVos family members. After the November 2016 election, President Donald Trump selected Betsy DeVos, one of the family's members, to become U.S. secretary of education. 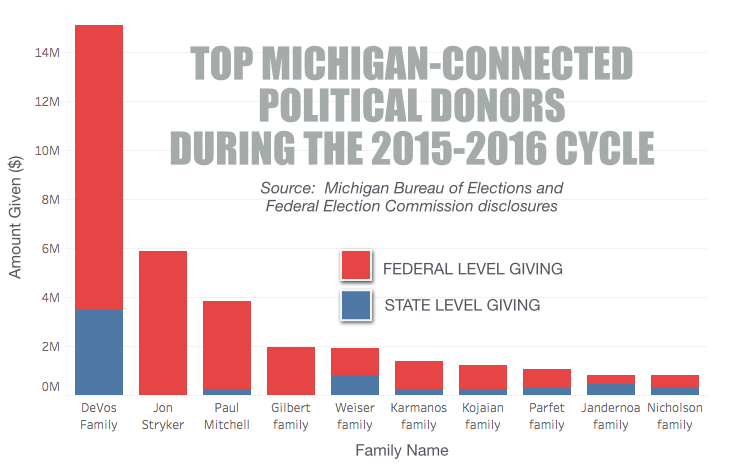 Jon Stryker, whose family founded the Kalamazoo-based Stryker Corp., was once a top donor in state races in Michigan. However, in recent cycles, he’s focused elsewhere. While Stryker is listed as a New York resident in most campaign finance disclosures, he is a Kalamazoo native, and he still uses a Kalamazoo address on some of his contributions, so he’s included in this list. Almost all of his contributions tracked for this story went to federal candidates and committees last cycle, including $2 million to a pro-Hillary Clinton Super PAC, Priorities Action USA. Businessman Paul Mitchell is on this list mainly because of the money he provided to his successful campaign for Congress in 2016. Mitchell, the former CEO of Ross Education, won the 10th District seat while giving or loaning his campaign a total of $3.5 million, according to his campaign finance reports. He also gave about $190,570 to a state ballot committee in 2015 that opposed increasing the sales tax for road improvements. Dan Gilbert, the founder of Quicken Loans, has financial interests in a Detroit casino so he can’t make campaign contributions at the state level in Michigan. But he and his wife, Jennifer, were large donors to federal candidates and committees. Dan Gilbert gave $1.25 million to a pro-Chris Christie Super PAC. Later in the election cycle, the couple gave $150,000 to a fundraising committee for Hillary Clinton, the Hillary Victory Fund. Ron Weiser, who founded a real estate investment company in 1968, is now once again the chair of the Michigan Republican Party. He and his wife, Eileen, continue to be major donors to Republican candidates and supporters. Ron Weiser also heavily supported his own successful campaign to become a member of the University of Michigan Board of Regents, providing about $608,000 in support for his campaign, according to campaign finance reports. The following is a summary of MCFN’s tracking of top donors’ political contributions. It is based on Michigan Bureau of Elections filings and Federal Election Commission filings. A spreadsheet with more information is available at this link.